Jawbone’s Up iPhone accessory now has a November 6 ship date, a $100 price tag, and a free iPhone app that help track your steps, sleep cycles, and more. First announced in July at TED Global, the Up is a slim, electronic bracelet that tracks your movement and sleep, and syncs with an iPhone app that also happens to go by the Up moniker. Though Up seems like a bit of a departure for Jawbone, a company known better for its Bluetooth headsets (Icon, Era) and Jambox speaker, Fass said that in fact it fits right in. “We’re focused on the mobile lifestyle,” he added. The Up will come in seven colors (black, brown, dark red, bright red, white, silver, blue) and three different sizes (small, medium, and large). Inside its rubber shell, the bracelet houses a battery that offers up to ten days of use on a single charge. Pull the rubber cap off one end of the bracelet, and you’ll expose a 3.5mm (1/8 inch) plug; the Up ships with a USB adapter that connects to the plug for charging. Plug the cable into your iPhone’s headphone jack, and the mobile accessory syncs with the Up app. 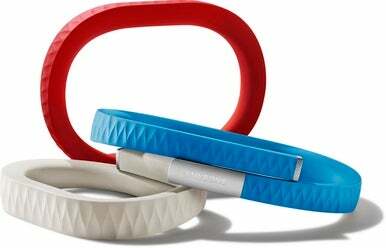 The rubber bracelet also contains a precision motion engine, which Jawbone says tracks every step you take and can also monitor your sleeping. If you schedule an alarm in the app and sync it to the Up, the band will monitor how deeply you’re sleeping in the half-hour window you’d like to wake up, and the built-in motor will vibrate at what Up calculates as the ideal moment to wake you most gently. And you don’t have to take off the Up when you’re showering or exercising; Jawbone says it’s sweat-proof and water-resistant to one meter. The band also sports a single button, which you can use to trigger workouts, indicate that you’re going to sleep, or resume normal step tracking. Once you enter a few personal details (like height, weight, and gender) into the Up app, it can calculate not just the total number of steps you take each day, but also how many calories you’re burning. The app can optionally use the iPhone’s built-in GPS technology to log specific details about individual workouts, too. The band itself can store 30 days’ worth of data, so if you don’t take the time to sync for a day or two, it’s not a problem. Up’s motion sensing technology is powered by Fullpower’s MotionX. You set your own goals in the app, like how many hours of sleep you’d like to get each night, or how many steps you’d like to take each day. The app’s Me screen charts your daily progress towards those goals; flip to landscape mode and you’ll see historical data charted over time. The app also lets you configure a “team”—its own version of a friends list. For the time being, Up relies on establishing your friend connections manually by searching for your buddies by name or email address; Fass said connections with other services like Facebook might come later. “Friends are a powerful motivator,” Fass added—and that’s true whether your relationship is more competitive or collaborative. The app includes a realtime stream of your friends’ activity, though you can configure exactly what elements of your activity are shared, if any. “We’re taking privacy very seriously,” Fass said. To take your competition or collaboration to the next level, the app allows you to create Challenges. One collaborative challenge that Fass demonstrated sought to “walk around the Earth together.” As more Up users join the group, their steps contribute to the goal. Various partners, like GE, 24 Hour Fitness, Daily Feats, and Alliance for a Healthy Generation, will offer challenges of their own; some will even offer charitable donations when certain collaborative goals are met. Fass said that the photojournal approach provides extra motivation to eat well. Knowing your friends will harass you if you photograph your breakfast donut is extra motivation to reach for (and snap a photo of) the granola instead. “Reciprocal motivation changes behavior,” Fass said. The band itself changes behavior, too. You can configure the Up to vibrate not just at wake-up time, but also after specific lengths of inactivity. The $100 band is available now at Jawbone's website, and will also be sold at the Apple Store, Best Buy, AT&T, and Target stores. 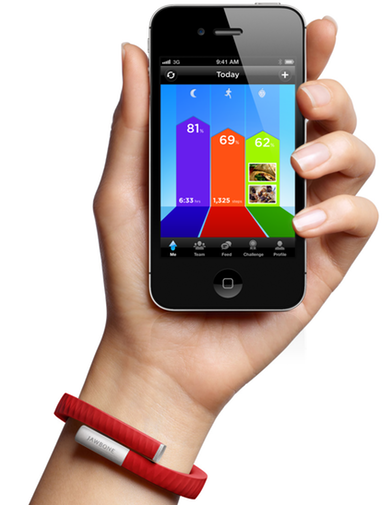 It will come to the UK on November 17, and other countries soon after, according to Jawbone. The free Up app is available now in the App Store. Updated 11:10 a.m. ET to indicate that the Up app is available now.